The far icy reaches of our planet are no longer out of reach. Visit the rugged wilderness areas of Antarctica and the Arctic, where sightings of seals, penguins and whales are daily occurrences, and majestic icebergs often form the backdrop for your adventure. Peregrine's expedition ships unlock a miraculous, forbidden and fascinating world. Each day spent in these surreal landscapes brings the possibility of new wildlife sightings. In the Antarctic, that might mean humpback whales, orcas and leopard seals, while the Arctic sees the mighty polar bear hunting on the ice as the unicorn-like narwhal swims below. Few who visit these regions come home unchanged. Peregrine, together with partners Chimu and Quark Expeditions, has led thousands of polar voyages and uses this wealth of combined experience to plan exceptional journeys. Each itinerary is carefully designed to offer the perfect balance between exploration and relaxation. Drawing on the knowledge of polar experts and enthusiasts, Peregrine promises a unique insight into these beautiful and mysterious destinations. Travel with a team of polar experts from a range of different fields including glaciology, ornithology, marine biology and polar history. Their onboard lectures will provide an invaluable insight into the region and no question will go unanswered, whether it’s to do with the hunting habits of polar bears or the geology of the Melchior Islands. From the stylish Ocean Atlantic to the immaculate Hondius, these ships are nothing short of superior. While the former boasts a gym, boutique and panoramic views from the bar, the Hondius is one of the few elite civilian ships with a Polar Class 6 notation. 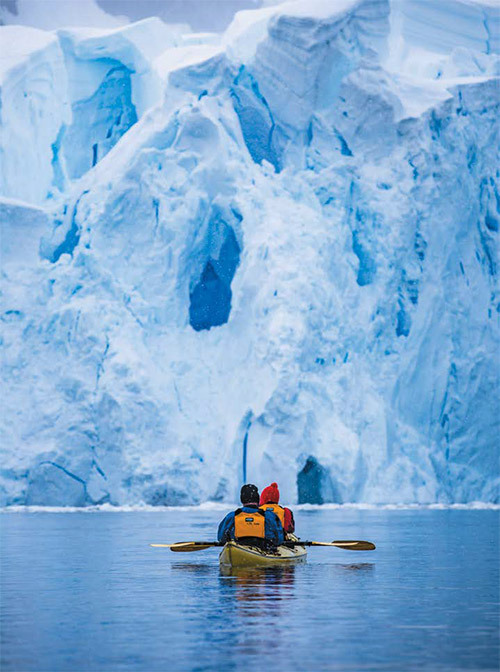 These exclusive voyages offer not only up-close encounters with glaciers and wildlife, but also the chance to go kayaking, snowshoeing – even camping, if it’s a voyage on the Hondius. It’s a rare opportunity to experience these environments in an unmediated way. Peregrine's polar voyages deliver maximum value with minimal fuss. Enjoy high-quality cuisine and living quarters that are more than comfortable. With at least two excursions each day, even your expedition boots are taken care of and included in the competitive price. The ships boast onboard chefs to prepare a range of hearty, quality meals. While the world outside the ship will undoubtedly mesmerise you, Peregrine hopes to craft a world inside the vessel that also captures your imagination. With personalised service and dedicated teams on hand to help travellers, these ships are like four-star hotels on the water. Peregrine boasts exceptional safety standards and eco-credentials. From undergoing external safety audits to being part of the AECO & IAATO and choosing carbon neutral vessels, Peregrine, Chimu and Quark are committed to sustaining these beautiful regions and upholding the highest safety standards. If you’re travelling alone, you don’t have to pay a singles supplement – Peregrine can pair you up with someone of the same gender. Triple share cabins are also available on most vessels, and on some you’ll find great value quad shares. People who ordered Polar Voyages – Antarctica & The Arctic also ordered the free travel brochures below. Click on the images to find out more about these brochures.